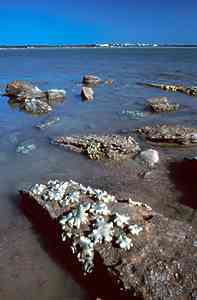 Different animal and algae species are adapted to living on rocky, sandy or mud shores. These all have cliffs of various degrees of slope and ruggedness. 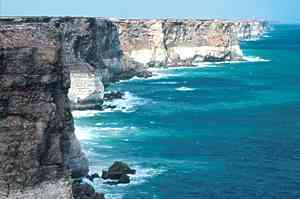 The rocky coasts occur in southern and north-western Australia. The associated beaches are of minor importance. In southern Australia the best known example is the vertical cliffs of the Great Australian Bite. In north-western Australia are the cliffs of the Kimberlies. On cliff shores and other rocky shores there are also subtle differences in the grain structure of the rock, its smoothness, indentations, cracks or gutters. Click here to investigate the different major types of Rocky Shore. 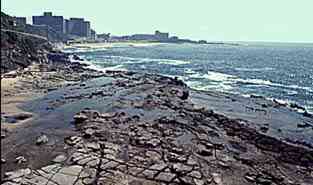 Here extensive ocean beaches are dominant, bounded by rocky headlands, reefs and shore platforms. Large intertidal platforms, swashed over by waves are excellent habitats for intertidal animals and algae. The Hawkesbury Sandstone region which extends from Newcastle (in photograph) to Kiama near Woolongong is a good example. These occur where beaches have formed off rocky promontories, partially enclosing lagoons and estuaries between themselves and the old shore. Barrier Beach Coasts are common along the east coast of Australia between Bass Strait and the Tropic of Capricorn, eastern South Australia and south of Perth. There are also small barrier shores in tropical north-eastern Queensland and on some Northern Territory coasts. These coasts are very common in northern tropical Australia. Mangroves and salt marshes are present accompanied by a fringing coral reef. 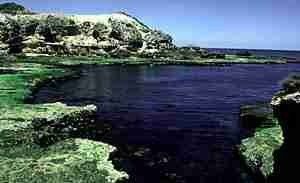 They are extensive between North West Cape and Port Headland and in the tropical and temperate gulfs. Here is the Tidal Plain at Darwin. The tidal range is a couple of metres between the highest and lowest tides. Because the shore is so flat, in some places kilometres of mud shore is exposed when the tide goes out. One favourite habitat is under boulders. It makes a great difference to the type and number of species whether a boulder is situated on bare rock, on sand, in mud, or surrounded by thick algae against other boulders. Boulder fields situated in muddy sand in swift-flowing water with an abundance of algae is an environment that is usually rich in different intertidal species. Although animals and algae must live upon rock, or sheltered in cracks and crevices, there are also more habitats available to those that live on top of, or within, sandy and muddy habitats. Organisms that live on top of, or within, mud or sand habitats are benthic, which means bottom dwelling. Those that live on the substrate surface are called epiflora (most marine algae) and epifauna (animals such as anemones, sponges, molluscs and crabs). Animals that live within the sand and mud are called infauna. Examples of infauna are the worms and many bivalves. Strong swimming animals, such as fish, marine mammals, and marine reptiles, able to move independently of the direction of the current, are called nekton. Animals and plants, including the juvenile forms of many molluscs and crustaceans, as well as single celled organisms which drift with the currents are called plankton. It is estimated that 75% of all benthic invertebrates have a planktonic larval stage. Although each animal produces millions of offspring each year, only one or two will survive to adulthood. Most will be eaten by carnivores and planktivores. Bennett, I. (1987) W. J. Dakin's classic study: Australian Seashores. p. 3-12, Angus & Robertson, Sydney. Davey, K. (1998) A Photographic Guide to Seashore Life of Australia. p.8, New Holland, Sydney.